Colorful additions to your mineraology classroom, these carefully crafted models are painted with durable enamel in colors that simulate the actual crystal. 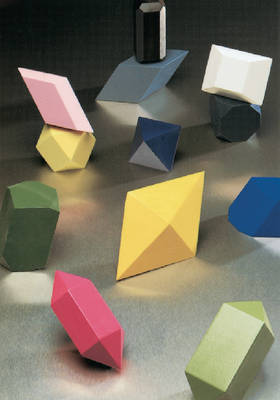 Measuring from 3" to 6" in length, the models are precisely shaped with correct angles to illustrate the six basic crystal structures: isometric, tetragonal, hexagonal, orthorhombic, monoclinic, and triclinic. Each is color-coded for clear crystal representations. Includes a teacher’s guide and all models in a compartmented storage box. Set of 12.